Pictures have circulated the internet for months but only now is John Deere prepared to discuss some of the details of its electric cable powered 300kW (400hp) tractor prototype. Flagged up as the first fully electric, permanently cable powered vehicle capable of fully autonomous operation, the GridCON tractor, as it is known, certainly looks very different to earlier John Deere prototypes. There is no cab and no rows of heavy and expensive batteries below the bonnet. Instead, it is based on a cable connection to a standard power supply, which paves the way for farmers to use home-produced electricity. John Deere has yet to firm this up, but it is our understanding that a 100kW (134hp) electro-motor powers the wheels, leaving up to 200kW (268hp) available for electric implements. A drum fixed to the machine carries up to 1000m of cable, although the length can be extended if required. In the field, the cable is fed out onto the ground and reeled in by a robot arm. The arm extends to cater for different rear implement widths. An intelligent guidance system is also used to prevent the tractor running into or over the cable. The tractor, which is based on a 6120R IVT, follows pre-set paths fully autonomously at operating speeds of up to 20km/hr. We’ve studied the picture but cannot find anything that looks like a sensor-based obstacle detection system, but it could be that small cameras on all four sides provide a 360-degree bird’s eye vision. Based on a 6R Series tractor chassis, the SESAM prototype produces 130kW (174hp) of continuous power and a maximum output of around 298kW (400hp). What we do know is that GridCON can also be guided manually using a remote control, which will be useful when manoeuvring the tractor to start work at the headland or onto a trailer for transport. 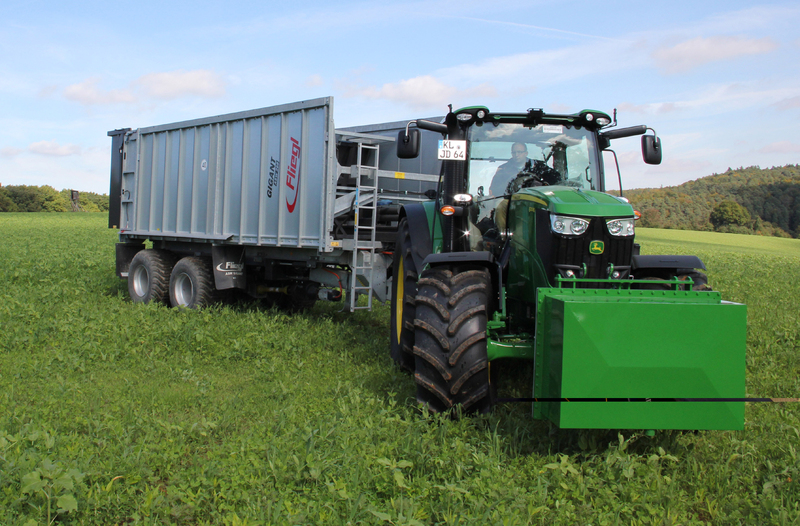 Requiring a power supply of 2.5kV AC, the concept tractor uses a 700v DC bus for electric power distribution both onboard and for implements and drivetrain efficiency is around 85%. Total empty weight of the working prototype, including cable drum and robot arm is about 8.5t, which, says John Deere, is about the same weight as a conventional 6195R but with twice as much power. Research engineers are aiming to reduce the weight by at least a tonne. Offering quiet and emission-free operation, the company reckons that compared to battery-powered tractors, the prototype delivers around 50% lower machine and operating costs. 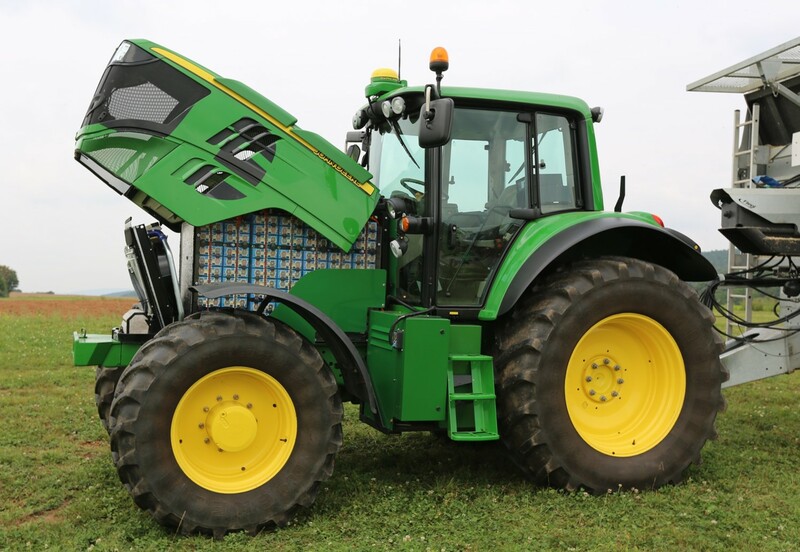 Connected to a modified John Deere 6RE, Battery Boost provides up to 107kW (143hp) of additional power. In recent years, John Deere has tended to show new electric concepts at SIMA. For example, Battery Boost, which was connected to a modified 6RE and claimed as the industry’s first tractor able to plug into the grid, was on the company’s stand at the 2015 edition of the French show. At SIMA 2017, the company previewed its first fully electric (battery-powered) tractor - the 300kW SESAM (Sustainable Energy Supply for Agricultural Machinery). So, is John Deere planning to bring the GridCON tractor to this month’s SIMA? No, we are informed but now that it is out in the open, then perhaps there are plans to bring it to Agritechnica later this year? Footnote: Funded by the German government and managed by the German Aerospace Centre, the GridCON tractor is the result of a joint project with the University of Kaiserslautern and BAUM Consult.